A few weeks ago while working at Bad Woman Yarn, I had the chance to peruse some old knitting pattern books. One of them was Beehive for Bairns, which I just found is actually available online via Project Gutenberg here! They don’t have a publication date, nor did the book itself, but I’m guessing sometime in the 40s. While looking for something to knit for my niece, I came across the Girl’s Flared Coat (B in the picture here) and thought it would be cute. It also happens to go up to a size 2, which is just right for my niece right now. So I embarked on this project in some nice charcoal grey yarn (coincidentally it’s Berroco Vintage). Unfortunately, grey sweater pieces do not make the most interesting projects to photograph, but I did snap a quick picture while meeting with my knitting group last week. Sweaters for a person this small are pretty speedy to knit, so I’m hoping to have it finished soon. Then I can ask my sister for super cute modeled pictures! Another Bad Woman Yarn project was Mrs. Watson – a really fun pattern by Martina Behm which I knit in Berroco Ultra Alpaca Light. This project was a little tricky. You start out and you’re thinking “Hey, I know how this goes!” and then it all changes. Suddenly the pattern that you’ve been following turns a corner – literally – and you start knitting a new shape! The Wendel socks already got their own post, but I’m including them to make my FO series complete. I didn’t really enjoy knitting the socks, though the finished project turned out well. At least I got one of my favorite knitting pictures out of it! That was taken quickly and without a lot of planning as I finished up the toes at a local coffee shop, but it turned out really well! My friend Stephania from Three Fates Yarns and I met up at Madrona. She gave me some of this new sock base and asked if I could knit a quick sample sock. Of course I could! The pattern is Bubbles by Cookie A. We met up a few weeks later for the Rose City Yarn Crawl (in Portland, OR). I took the train down and used my knitting time wisely. We had a great time visiting all 11 stores, seeing a lot of familiar faces, and battling with huge knitting needles. I had the sock done by the end of the day. I believe I even did the Kitchener stitch at a sushi restaurant. It seems to be a bit of a trend this year that much of the knitting I can share on the blog is from working at Bad Woman Yarn. This was an idea I had to use three colors of Super Lamb – a simple but neat striped cowl. It’s a knit tube pairing three colors in all possible combinations of two. Then at the end, I grafted it all together. Cute and easy! When I saw the Pairfect yarn at Bad Woman Yarn, where I work, I knew I had to get some. I am a sucker for perfect stripe matching, and when I use self-striping yarn I spend a lot of time and energy making sure I cast on at the exact same point in the color sequence for both socks. I made quite a bit of progress on them in January when I took them as one of my few projects on a week-long ski trip. And by February 12th, I was doing the kitchener stitch at Madrona. I really enjoyed working with this yarn, although the stripe sequence was not quite what I had imagined. The yarn starts off dark grey, then switches to the stripes, and finishes with a bit more grey. The foot of the sock is navy. I think it would make more sense to have the “main” color on the leg be the same as the foot, but that’s just me. Also, it may have been my tension or it may have been the yarn, but my stripes didn’t match exactly to the stitch. By mid-sock I was almost exactly 1/2 a round off. I know that matching exactly is probably not an attainable goal, but my Type A brain would really like it if it were. At least it’s easier to set up than traditional self-striping yarn! Overall I’m quite happy with the yarn and the socks. Hi all, we’re back! I came to post and realized that there was an issue with the hosting, so the site was down for a bit. But we’re back in action! Last year I did WIP Wednesday and went through all the WIPs from the beginning of the year. This year I haven’t been focused as much on WIPs and I’ve been neglecting to post my FOs. Now through the end of the year, I’ll be sharing some projects that were finished in the past year or so. The first FO of 2016 was this cute baby hat – Gather by tincanknits. I whipped it up for a baby shower for a coworker, and it’s knit in some really lovely Malabrigo Rios. The pattern includes several sizes for the hat, and also a cowl pattern. This was a quick knit, and turned out really cute! I knit it one evening while watching a bunch of Psych on Netflix, and it was really well-received at the baby shower. For the past few weeks, I’ve been working furiously on these socks, and declaring that I hate them to anyone who will listen. You see, a while back my LYS coworker Neal and I devised a trade. 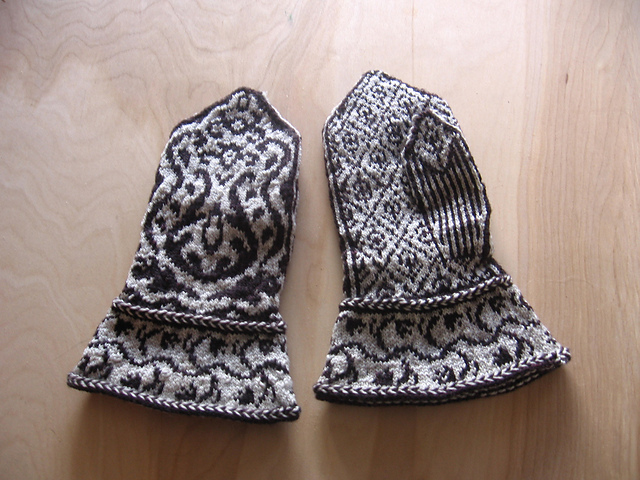 She would knit me the Damask Mittens from Fall 2013 Jane Austen Knits, and I would knit her the Wendel socks. The mittens were handed over ages ago, but I just hated knitting the socks. But, you see, the mittens were not without annoyance. Although modeled by an adult, they were sized for a child. The gauge was ridiculous. And Neal adjusted the pattern and knit them for me. But try as I might to knit the Wendel socks, they fell into a category of knitting that I really don’t like. For a while I considered asking her to pick a different pattern, but after she knit those mittens I figured that wasn’t really fair. Lately I started taking the socks as my “travel knitting” to force myself to work on them. I’ve said it before, but I basically knit two types of projects. And then when I got to the toe, it all got confusing. The instructions weren’t very clear, and the designer used the term “knit” to mean “work in pattern”, which results in about 1/3 of the finished projects on Ravelry having a plain knit toe. But I figured it out (and then later figured out that there is a note about it in the Ravelry pattern notes). But seriously, update your pattern PDF, dude! In any case, they’re done. Finally. New pattern: Interchange… in a new magazine! Today is an exciting day. First off, because I have a new pattern, Interchange, out. But also because these socks are in the brand new Stranded Magazine! I heard about it nearly a year ago – my friends and fellow knitting group members Andi, Erin, and Monica were starting a knitting magazine. They invited me to submit a pattern, and I did. And today I can finally share it with all of you! I love this yarn, Hazel Knits Artisan Sock in Beach Glass. The color is so lovely, and shows off the pattern detail really well. One of my favorite things about this pattern is that the patterned section is relatively small and the majority of the sock is plain stockinette. I love having patterning on the leg, but the plain foot makes for great movie or road trip knitting and a really comfy sock. There are also a bunch of other awesome patterns in the magazine by Lee Meredith, Andi Satterlund, and Erin Birnel. So check it out!